Kay's Adaptable Adventures: The Secret World of Arrietty-Opens TODAY! If you've been a follower of mine for awhile, you know my absolute FAVORITE director is Hayao Miyazaki and I adore Studio Ghibli movies; Spirited Away, Princess Mononoke, My Neighbor Totoro, Howl's Moving Castle.....I love them all!! So you can imagine my pure, girlish delight when I hear about the new movie coming out, The Secret World of Arrietty-opening TODAY as a matter of fact. "Arrietty (voice of Bridgit Mendler), a tiny, but tenacious 14-year-old, lives with her parents (voices of Will Arnett and Amy Poehler) in the recesses of a suburban garden home, unbeknownst to the homeowner and her housekeeper (voice of Carol Burnett). Like all little people, Arrietty (AIR-ee-ett-ee) remains hidden from view, except during occasional covert ventures beyond the floorboards to “borrow” scrap supplies like sugar cubes from her human hosts. But when 12-year-old Shawn (voice of David Henrie), a human boy who comes to stay in the home, discovers his mysterious housemate one evening, a secret friendship blossoms. If discovered, their relationship could drive Arrietty’s family from the home and straight into danger. 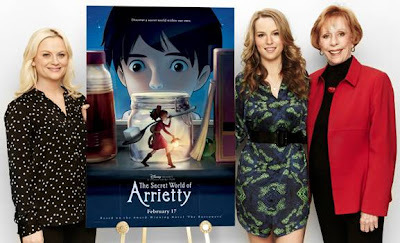 The English language version of “The Secret World of Arrietty” was executive produced by Kathleen Kennedy and Frank Marshall, and directed by Gary Rydstrom." Like The Secret World of Arrietty on Facebook! I love the story of this but I am not sure I'd like the animation. Still cute though. Thanks for sharing this. We loved Ponyo. I am going to have to check this out.